We worked together with between the University of Copenhagen, the Danish Ministry of the Environment and several municipalities in Denmark to analyse and document the effect of certain public indicators on house prices and quality of life in the city. The publication was released in 2013. The University of Copenhagen, the Danish Ministry of the Environment and several municipalities in Denmark wanted to investigate which variables can affect real estate prices, and thus map out what makes a good city. Researchers from the University of Copenhagen examined 60,000 real estate contracts looking at the impact of several hundred variables on real estate prices. The study showed that it pays off to invest in an attractive city life, with close access to green spaces generating high property value. The results can be a powerful tool for city planners, real estate investors, and politicians for visualising the economic benefits of designing an attractive city space. 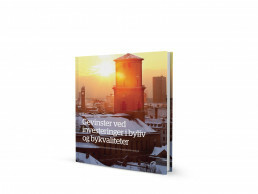 The publication covers the main takeaways of the project, summarising ten rules of thumb for what factors influence the value of a city as well as outlining four case studies. Sustainia created the publication together with the University of Copenhagen, the Danish Ministry of the Environment and several municipalities in Denmark.